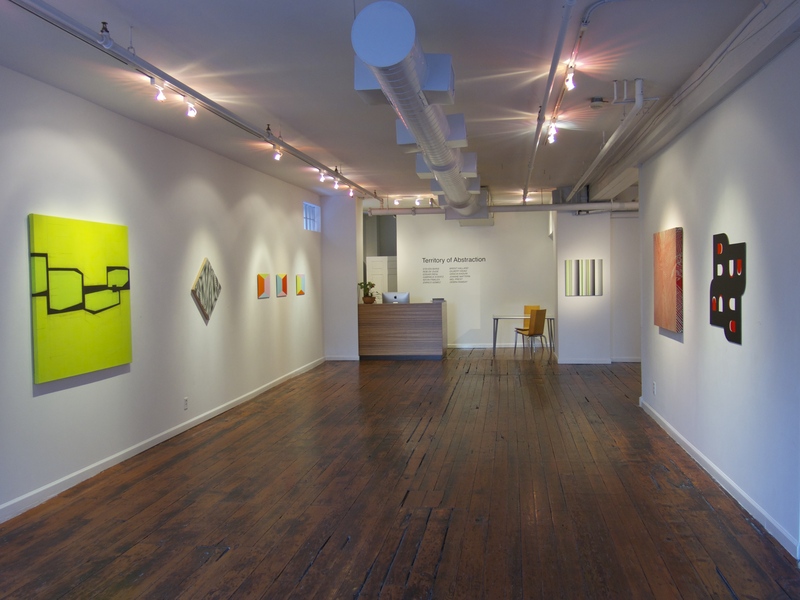 Two exhibitions I would like to see or to have seen, but sadly are too many miles away, with a great big ocean separating us, are Bed Bath and Between, at Soil Gallery, Seattle, which closed on 28 February, and Territory of Abstraction, at Pentimenti Gallery, Philadelphia until 04 April 2015. Both exhibitions feature artists from within and outside the USA. Both shows look ambitious and interesting. Bed Bath and Between, suggests ideas of home decoration and domesticity, (apparently there is a store reference in the title that is probably lost on UK audiences, we might point towards say Habitat or Ikea) hence in this show the paintings by Julie Alexander, Katrin Bremermann, Maria Britton, Dawn Cerny, Terry Green, Margie Livingston, Nicholas Nyland, Matthew Offenbacher, and Mathieu Wernert are set on highly patterned wall coverings, inviting us to consider their function, at the risk of our dismissing them as “merely decorative”. In 1948 Clement Greenberg expressed a concern that “the ‘all-over’ picture … comes very close to decoration, to the kind seen in wallpaper patterns that can be repeated indefinitely” and although the paintings on show at Bed Bath and Between are nowhere near the mural sized works that he was referring to, showing them against this backdrop seems to court the very spectre that Greenberg feared. The whole installation, does more than simply come close to decoration, it squares right up to it and… I don’t know whether to say delivers it an ultimatum, or gets in bed with it. 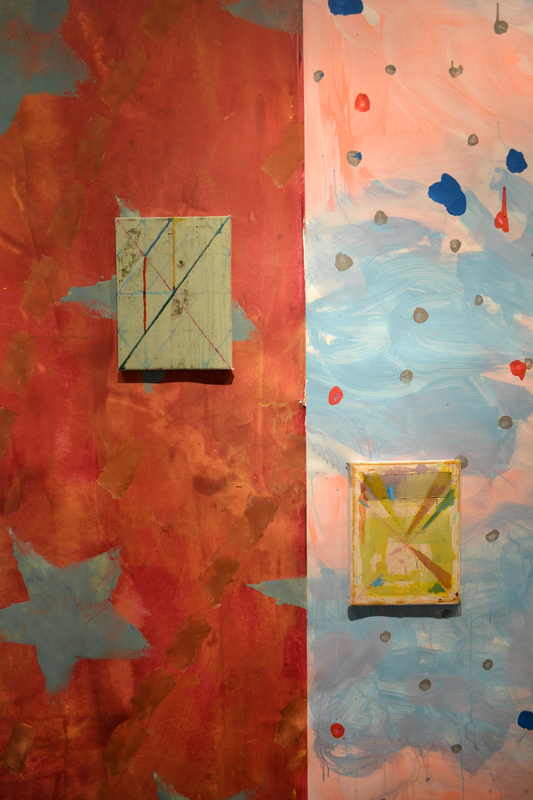 The wallpapers are hand painted by the three artists in the exhibition who also curated it: Julie Alexander, Nicholas Nyland and Matthew Offenbacher, provoking a dialogue between the roles of curator and artist and questioning where the art begins and ends, it becoming difficult at times to differentiate art-work from environment, portable easel painting from site specific installation. I am reminded of the work of John Armleder, though his paintings seem slicker in comparison to the more casualist work on view here, and in Armleder I get more the impression of clearly demarcated juxtaposition whereas here the paintings all but entirely merge with their surroundings. Julie Alexander’s Sweet Potato is comprised of three layers of painted or dyed unstretched fabric. 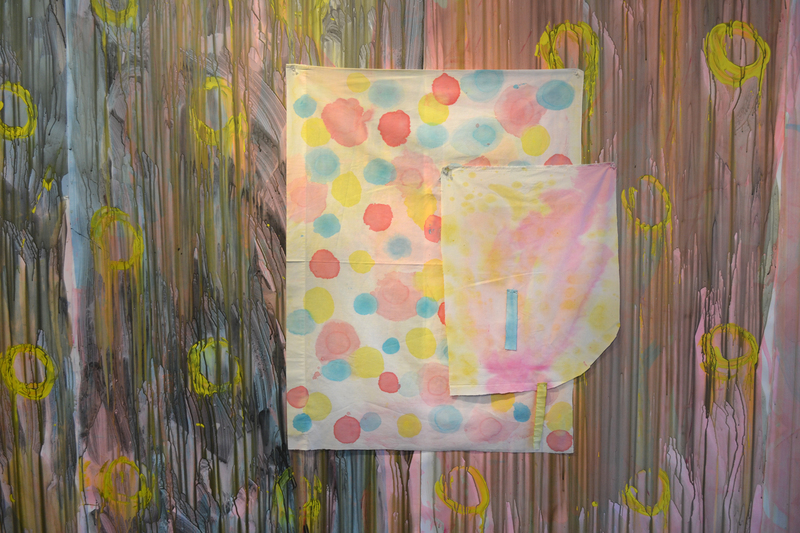 The base layer is hemmed and supports an informal design of multiple blobs in pastel colours, yellow, blue and pink. It is partially obscured by a smaller scrap stained in similar hues, and in front of that are pinned two tiny strips, one yellow and one blue. The painting may be less ‘finished’ than the wall behind it, the art work having become entirely provisional, asserting itself against the patterned background via its lighter tonality and the crispness of the hemmed edges, but never quite achieving independence. Perhaps this is less so in works like Katrin Bremermann’s Letter to Sol where the art object is more clearly differentiated from its context, but here a kind of merging does also take place by virtue of its veil like transparency. 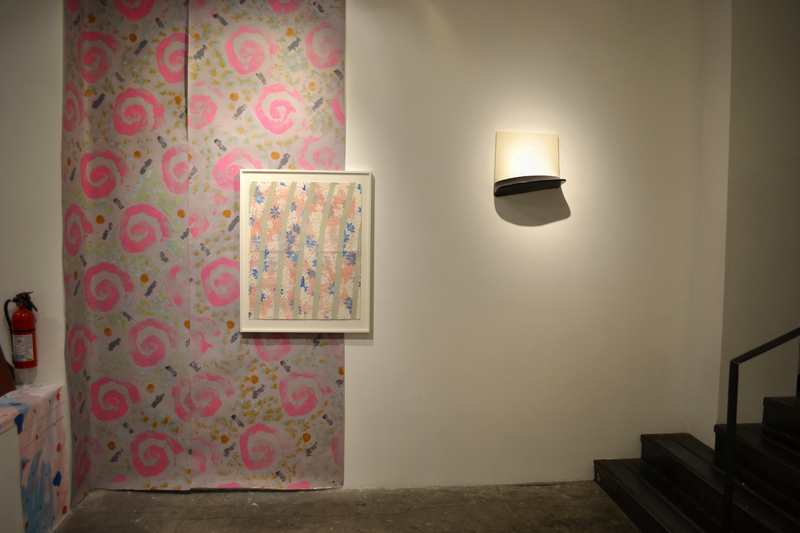 Dawn Cerny’s screen print on the other hand might itself be a fragment of wallpaper. 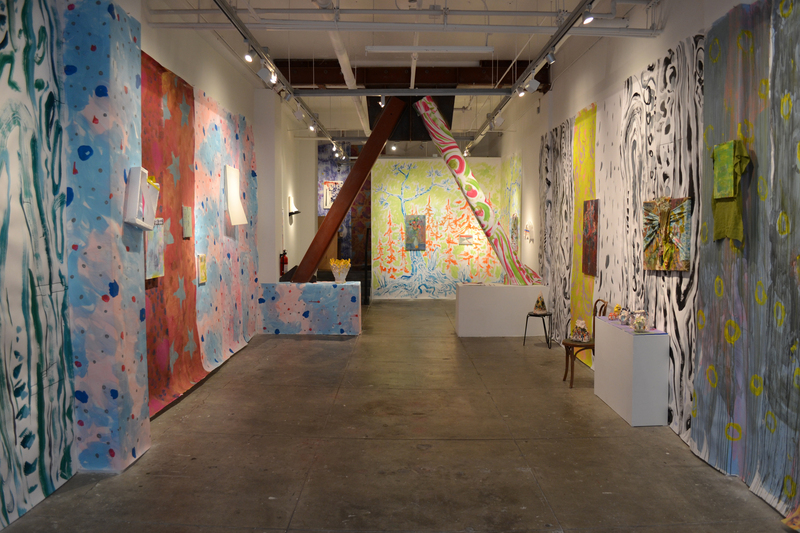 Installation shot including works by, from left to right, Dawn Cerny and Katrin Bremermann, Wallpapers by Julie Alexander, Nicholas Nyland and Matthew Offenbacher. Photo by Julie Alexander. UK artist Terry Greene’s diminutive paintings, are more muted in colour than the wallpaper against which they attempt to distinguish themselves. 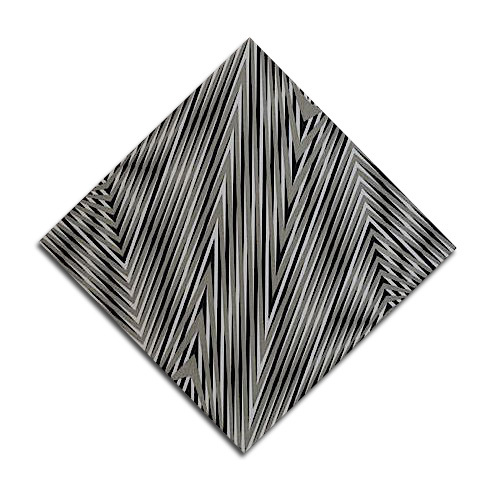 Contrast is found in their tendency more towards the geometric than to the gestural style of the paper behind. There’s a push/pull going on not only within the paintings but between the paintings and the various wallpaper motifs, and I think this is generally the case with the various artists’ work on show here. Greene’s titles evoke snatches of overheard conversation: “Something is still something, less than that is nothing”, “Lord have mercy! Is that what that is?” and “All we represent to them, man, is somebody who needs a haircut”, the paintings possessing something of the informality of vernacular language. The other USA show that grabs my interest just now could perhaps be positioned at the opposite end of an imagined continuum. At one extreme the dress code is casual, whereas at the other it is much more suit-and-tie. ‘Classical’ feels wrong when it’s abstract works we are considering but it possibly holds if we think of hard-edge, reductive, post-minimalist abstraction as Classical, and a softer, more lyrical, expressionist or casualist abstraction as Romantic. Maybe we could even invoke the Nietzschean categories of the Apollonian v.s. the Dionysian. At the Dionysian end we have Bed Bath and Between and at the Apollonian end, we have Territory of Abstraction, a group show of new paintings, works on paper and sculpture by twelve artists who, sharing an interest in geometry, colour, pattern and repetition, also manage to form a wider territory by approaching their similar concerns in uniquely individual ways. To quote the gallery write up: “When put together, their work showcases the expansive nature of contemporary abstract art, and the potential content of relatively simple forms”. Even at this extreme on my imagined continuum there’s all this variety. The artists are Steven Baris, Rob De Oude, Edgar Diehl, Gabriele Evertz, Kevin Finklea, Enrico Gomez, Brent Hallard, Gibert Hsiao, Gracia Khouw, Joanne Mattera, Mel Prest, and Debra Ramsay. I’m kicking myself now that realise I missed an opportunity to see works by Kevin Finklea at the Eagle Gallery, London, in November, where he was included in the group exhibition Panel Painting 2. Sometimes it doesn’t take an ocean to get in the way of a good show. 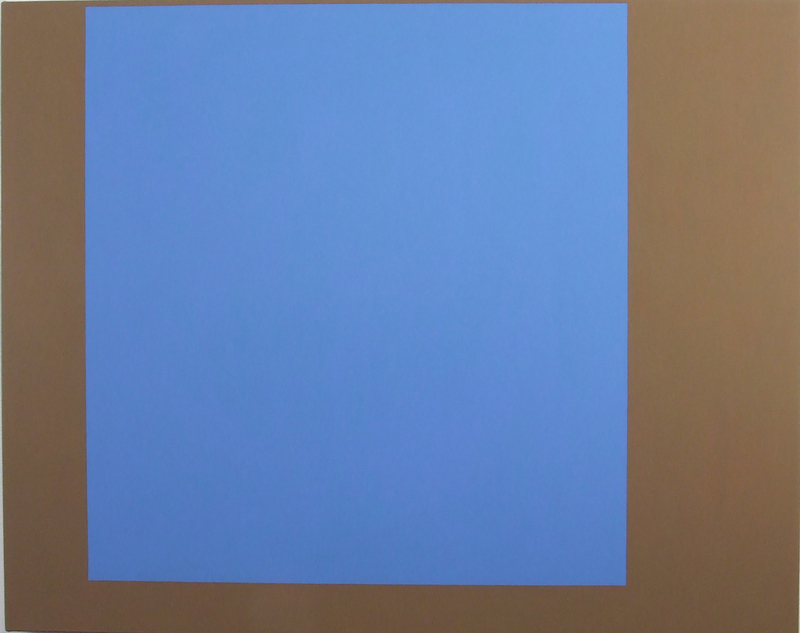 Seeing his painting at Territory only in online reproduction, a solid rectangle of blue on a brown ground, I am interested in the apparent simplicity of it and even more in what the colour does. However, struggling to imagine the size even though I know the dimensions and not being able to get up to the surface and see the relationship of paint to canvas, or check out the edges, I am alerted to the importance of actually seeing it for real. In the seventies, if we wanted to know what was being made over the water, in that same week, we often had to make do with black and white grainy photocopied images, so things have certainly improved since then, but the virtual image is a poor substitute for the “real thing”, itself already a re-presentation, an image presented to the occipital lobe. I have been following some of these artists online ever since seeing a report of the Doppler shows, geographically diverse artists taking their works on international tour by literally transporting them by suitcase: Steven Baris, Edgar Diehl, Kevin Finklea, Brent Hallard, Gilbert Hsiao, Mel Prest and Debra Ramsay. I am also familiar with Joanne Mattera’s work through her excellent blog. 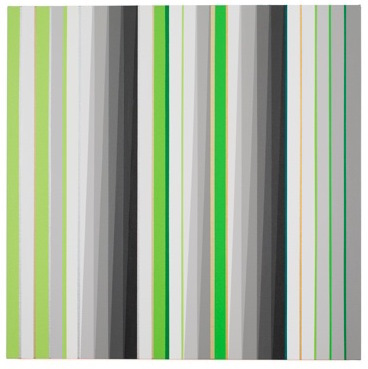 Rob de Oude’s paintings, with carefully placed repeated lines, focusing on colour rhythm and composition, and Gabriele Evertz’s sequences of clean stripes of pure hues contrasted with greys are new to me, as are the abstracted letter forms of Enrico Gomez and Gracia Khouw. Edgar Diehl and Brent Hallard create brightly coloured geometric forms that seem to confront us with the subjective constructed-ness of visual perception. Mel Prest likewise, with her highly personal systems of contrary directional lines, presents us with concentrated fields, that seem to pulsate with energy and even to generate their own light. 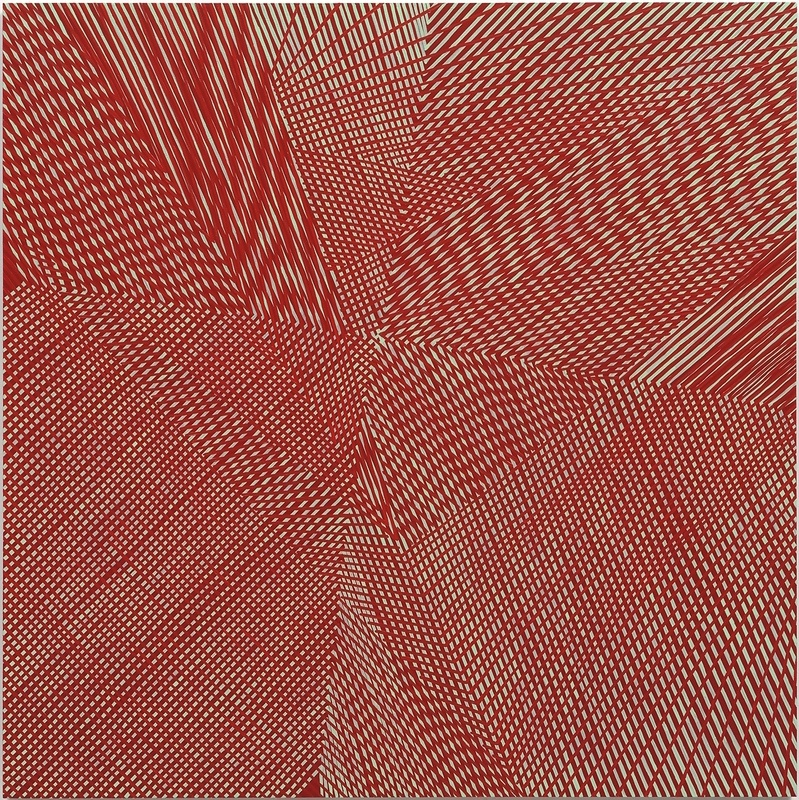 In Mirror Cycle the work seems to fold into itself, one red pushing against nearly the same red on a green ground, shaping the space. Prest, Diehl and Hallard seem to share with Steven Baris an interest in spatial ambiguity, and “opticality”, a watchword for all of these works, Gilbert Hsiao ‘s paintings for example, tending to elicit pre-linguistic experience, by which I mean that stage of perception before we are able to assign words or names to what is being perceived. At the risk of sounding too new age, I might suggest a parallel with the concept in the writings of Carlos Casteneda, of “stopping the world”. 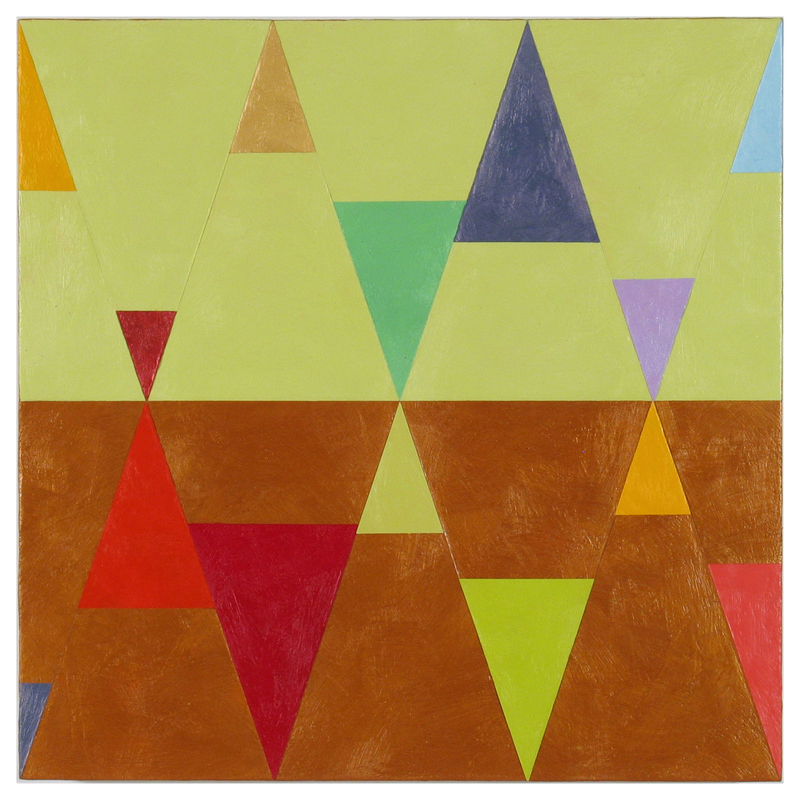 Joanne Mattera utilises a diagonally skewed grid as a structuring mechanism in her Chromatic Geometry series of paintings, enabling her to realise a set of diamonds intrinsically linked to the edges of the support, truncated by coloured triangles and held in a pictorial space by the addition of a central horizon line that divides the painting into two different coloured grounds before which the triangles appear to float. Debra Ramsay’s works on paper employ a mathematical logic, generating perhaps more precise forms than Mattera’s and the overall look is less pictorial. From what I can tell, there’s little or no colour. possibly white on white. My “perhaps” and “possibly” brings me back to noting the differences between virtual and “real” seeing, and hoping that we get to see some of the artists’ works from both of these shows in the UK sometime soon.